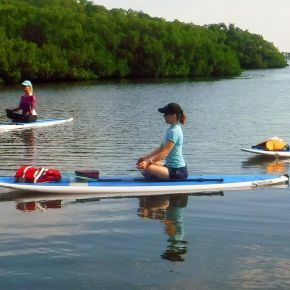 Stand Up Paddle Board Yoga is a fun activity that takes a beginner's yoga class from the mat and onto a paddle board. Slowly paddling the boards out into the crystal clear shallows, you will practice 1 hour of gentle yoga. This activity is suitable for everyone, even if it's your first time! Stand Up Paddle Board Yoga classes are offered every Friday at 5:30 p.m. and Sunday at 8:00 a.m. $35/attendee. Please contact Guest Adventures at extension 4446 to reserve.